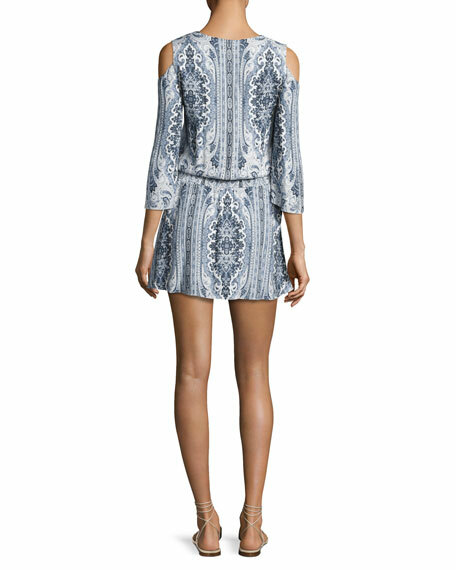 Alice + Olivia "Jolene" paisley-print day dress. Its initial collection of low-rise, well-fit pants in vibrant shades and prints made Alice + Olivia famous. Designer Stacey Bendet expanded the line since then to include a full collection of pieces cherished for their perfect fit and eye-catching flair. Stacey Bendet of Alice + Olivia answers our 5 Questions. For in-store inquiries, use sku #2148823. 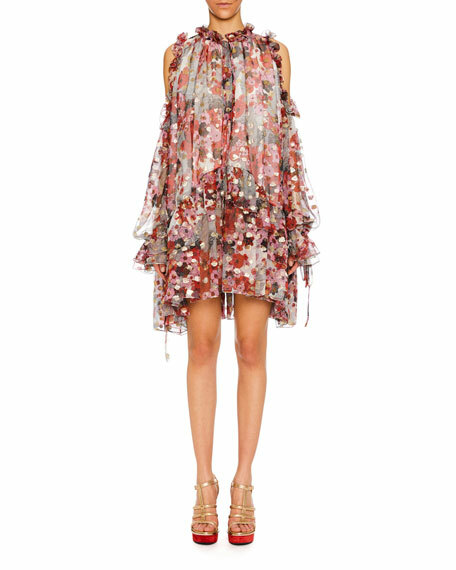 Alexander McQueen layered dress in feather-print metallic fil coup with ruffled trim. High neckline; button front. Cold shoulders. Long peasant sleeves. A-line silhouette. Slipover style. Mini length. Silk/metallic. Made in Italy. 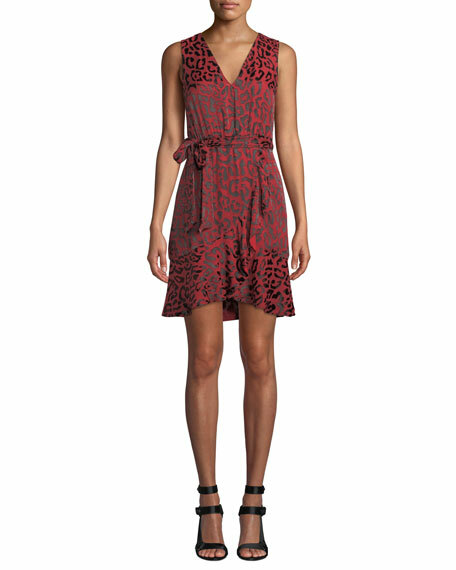 Alice + Olivia "Brooks" dress in leopard-print silk. Approx. 33.8"L from shoulder to hem. V neckline. Sleeveless. Self-tie belt. Fit-and-flare silhouette. Mini length. Exposed back zip. Viscose/silk. Lining, polyester/spandex. Imported. 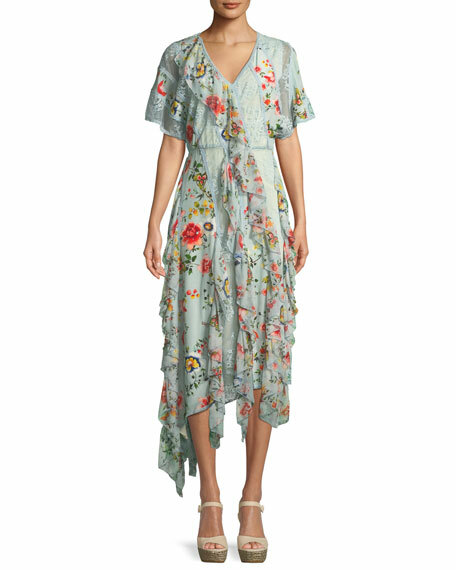 Alice + Olivia "Kadence" floral-print godet lace dress with ruffled frills. V neckline. Short sleeves. Nips in at waist. A-line silhouette. Hidden back zip. Midi length. Silk; combo, nylon. Imported. 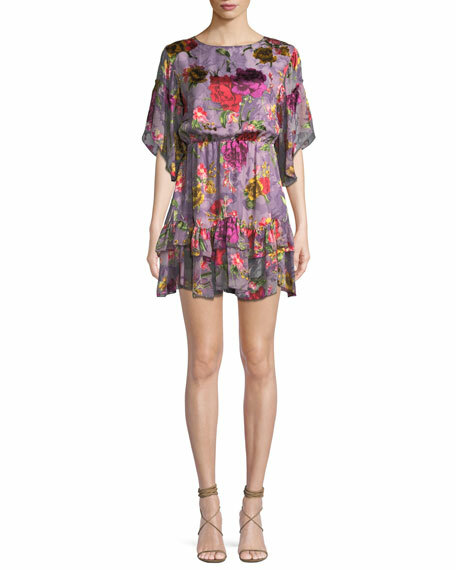 Alice + Olivia "Katrina" dress in floral-print. Crew neckline. Short, draped bell sleeves. Blouson top; cinched waist. Tiered ruffle hem. Flirty fit. Mini length. Back zip. Viscose/silk; lining, polyester/spandex. Imported.